I don’t know what I thought would happen. I guess I had worked it up in my mind. I’ve had nightmares about the return home to Detroit. I voiced these concerns to everyone who asked. With a dire look on my face I would explain, “I’m going back home to Detroit.” I half expected each of my friends to just have the funeral for me before I went. I would explain that yes, my daughter is getting married so I’m going back for the wedding. Almost in the same breath I would lament on my memories of my home town. It was like I was back on Parkgrove street living in the throngs of drug and gang activity where my nightmares began. On the plane, I tried to convince myself that Detroit was different, now and so was I. Things must have changed in the years since I had visited. I tried to sooth myself by thinking: I would be with my husband, family and friends. This was a joyous occasion. 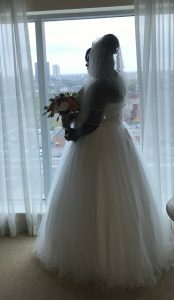 My daughter, Michaell was marring her sweetheart, Tanesha. Friends and family that I had not seen since I had written my memoir “Imagine Me” would be there. Then my thoughts hung there. What did they think of the book? Would family or friends be upset at some of the things I wrote? After analyzing this thought for way too long I was all ready for the response. I thought of who I would see. I played out different scenes in my mind. What they would say, how I would smile and respond. Thank you for your comments, I would say. Knowing in my mind that it meant something else, something secret. I remember thinking that yup I’m ready. I am all armored up for any response. The wedding was wonderful. I admit eventually I was so wrapped up in my daughter’s happiness that the armor gradually fell away. I remembered that this was not about me. Still, this was not what I had expected. Not one single soul had anything negative to say about my book. If I had to count, more than half of the people there didn’t even know I had written a book. I began to relax and have fun. I danced and laughed and as my guard went down, Pow, a comment from an ex in-law came out of left field. This comment was not in any of the scenes that I had rehearsed and previously played out in my head. It caught me totally off guard and I was taken aback. It was as if she and I were the only ones in the room. The music had faded in the back ground and I could tell that this was a pivotal moment of the night. Before I could absorb what was happening, and to keep from just standing there stymied, my head got in touch with my heart and my heart took over. Out of my mouth came the most poetic response. A response that my head could not have thought of. It was a truth that I had never spoken. A truth that no one wanted to believe or think about. As I was speaking, my brain tried to interfere: Maybe this is too honest, too harsh, my brain said. No, said my heart, this needs to be said. Once my mouth had finished, I smiled politely waiting for the person to absorb what I had said and reply. I really wanted to run away but my feet were like lead. She paused for a bit taking in what I had said, then she smiled and praised me for having courage. She praised me for having the ability to rise up out of the hell that Steve and I had lived through. She praised me for coming through it gracefully and then turning my life around. I could also see in her eyes the unspoken wish that was there. The wish that her brother could have better come out of that hell too. As she spoke, I could see that she saw this wish in my eyes as well. Then we both looked at each other and smiled. I think this might have been the first time we were seeing each other. It proved to me that you can’t go home again because that home is only in your head. You can go back, but home is different and so are the people who live there. If your heart is open you might re-meet people you thought you knew and discover the need to let go of things that may no longer be true.